This article details how I made my own B6A set. 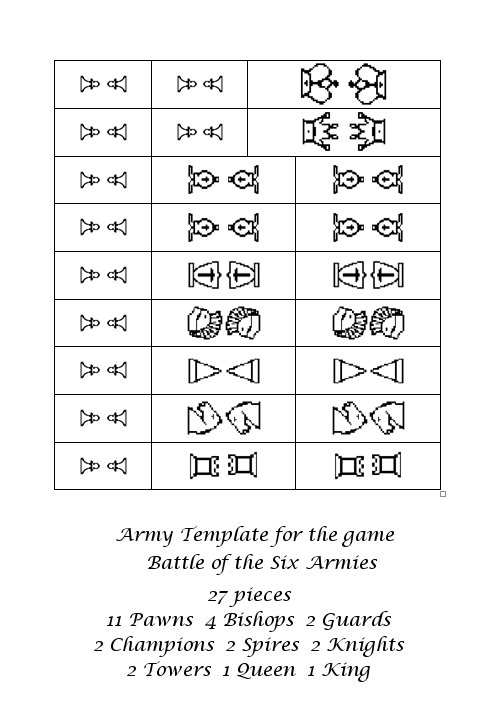 The approach used in making my own B6A set borrows heavily from my experiences when wargaming using 2mm models. 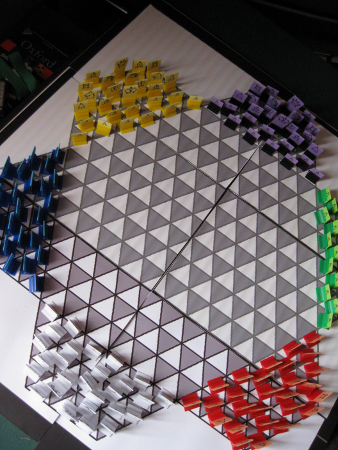 The materials used in making the board and pieces are shown in the image on the left. A: Magnetic A4 paper suitable for use with an inkjet printer. B:A4 white card suitable for use with an inkjet printer. E:A4 coloured card suitable for use with an inkjet printer. F: Self-adhesive magnetic card to provide bases for the piece-stands (optional). 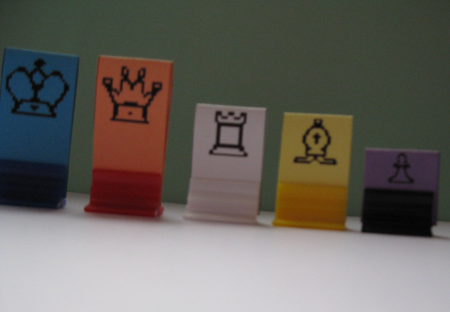 G: Plastic stands to hold the pieces (printed on card). 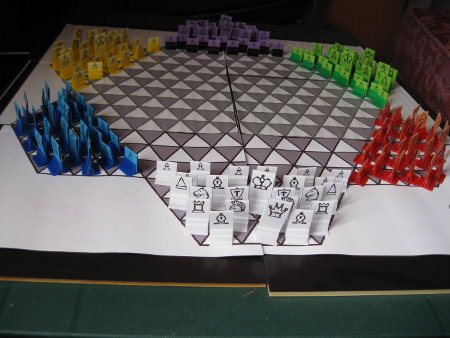 together to form the board and the pieces. 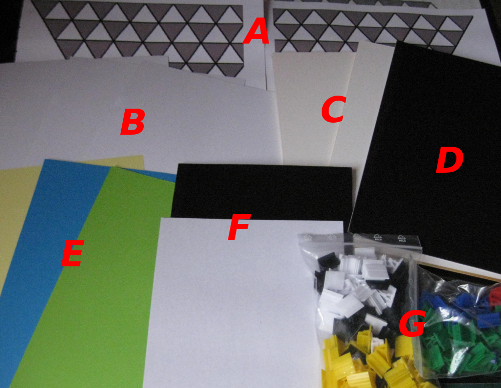 sheet to each of the six foam boards. place the inkjet printed magnetic board design. 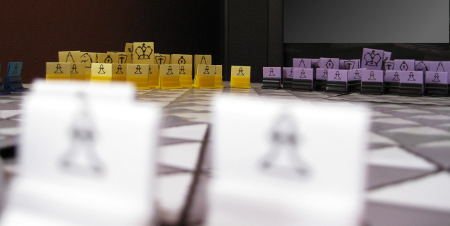 pieces, and of the board and pieces arrayed for the start of a game. Hi Joe, sorry if I've stolen your thunder, but B6A is a project I've been working on for just over the year. It's not been greatly playtested though there have been some chaotic 3-handed unfinished games between myself and my 2 sons (I'm sure they ganged up on me). I've also written a zrf for it which I'm in the process of making ready for general distribution. I am also toying with the idea of writing a preset for it using a hex-lattice board, but I'm not sure if Game Courier supports multi-player games? Hey, Graeme, now I know it was a good idea - somebody good is already using it! And I'm also sure your sons ganged up on you, as my son and daughter would just naturally do that with me. Anyhow, Game Courier is not directly set up for multi-player games, but it can be used for them if the players cooperate. Two are "captains", and they must put all the moves in. They email the set-up to the other players on their "team" as it is each's turn, and the players email them the moves back. Awkward, but I've played some 4-handed chess that way, although the game did peter out after a few moves. Got more to say, but am very busy right now, so ciao.